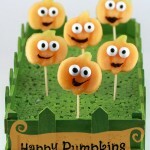 If you are looking for funny and easy Holiday treats for your kids, then I have something for you! 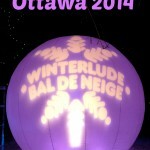 We've been living in Ottawa for 3 years, so we got used to winters here (a bit at least). We know it can be really cold and can last forever...! This year, we had our first snow already mid November! There were just a few flurries, but enough to make our garden white for a couple of hours. My daughter was so happy, she was dancing and singing and jumping saying "Oh, I love SNOW"! She was so excited to wear her new winter boots and to go for a walk into the first snow. Do your kids get so excited too with the first snowfalls of the season? 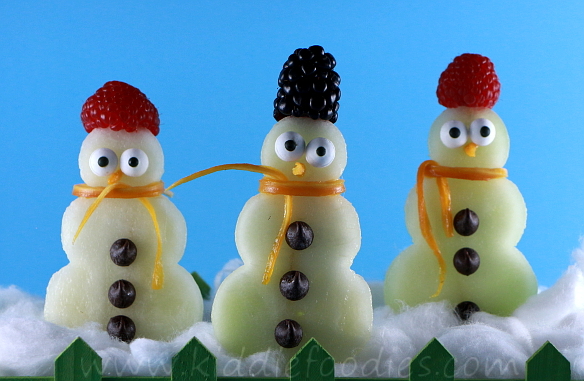 As we were in such a great winter mood, we made these cute little snowmen for dessert. They are really easy to make and made my daughter so happy. She loved them. The only complaint I got was that there were too few... 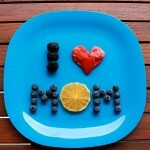 So I guess, we are making them soon again:) Hope your kids will love them too! 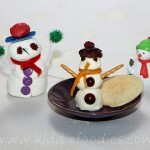 If you like snowman shaped treats and meals, check also our Snowman snack and Snowman meal for kids. Did you know that the best time to build a snowman is usually in the next warm afternoon directly following a snowfall with a sufficient amount of snow? 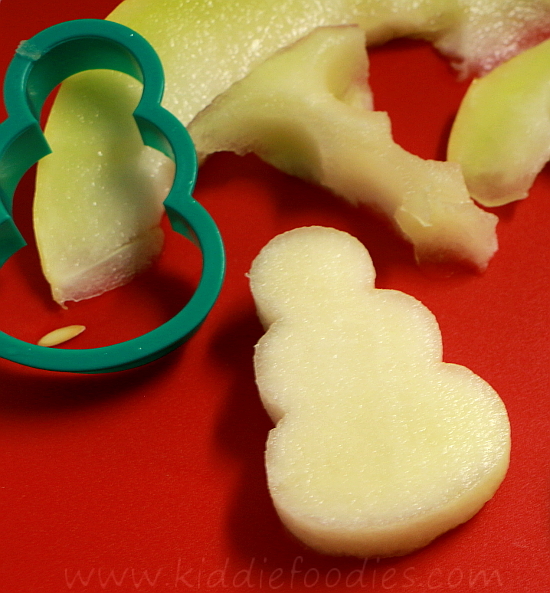 Step1 Use a snowman cookie cutter to cut shapes from the honey melon. You need to cut your honey melon accordingly to the size of your cookie cutter. If you don't have a cookie cutter, you may try to cut a similar shape using a knife. 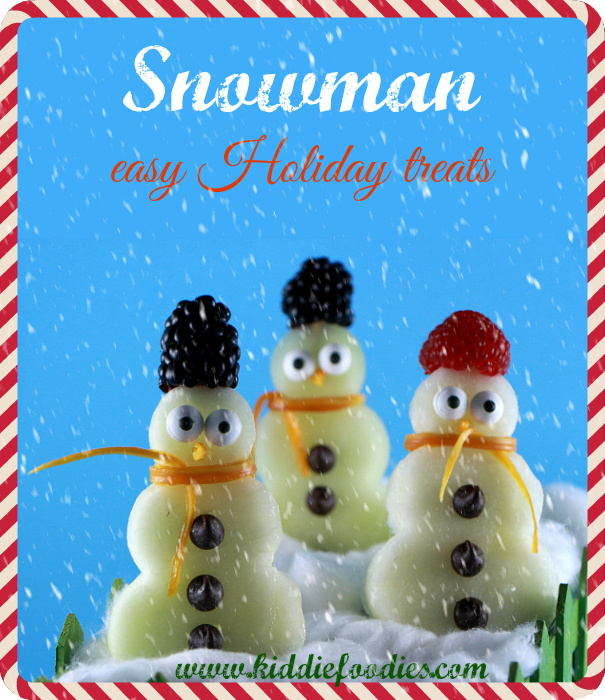 Step2 For each snowman, use 2 candy eyeballs to make his eyes and 3 chocolate chips to make his buttons. As the surface of the melon is wet (thanks to its juice) all that sticks just great. 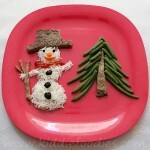 Mount a raspberry or a blackberry to the snowman's head to make his hat. Using a part of a toothpick for that; adjust its length as needed. 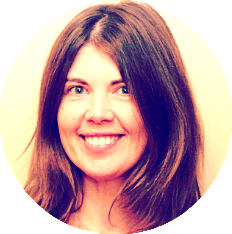 Cut a thin stripe of dried mango and use it to make a scarf. If your mango stripe is long enough, you can use just one. Ours was rather short, so we used 2 - one was fixed around the snowman's neck and the other was folded onto it. Mango is very flexible, so you can easily tie it around. 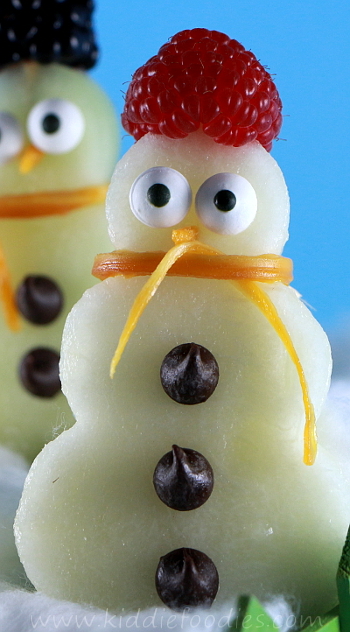 Use a small piece of a dry mango to make the snowman's nose. Step3 When your snowman is ready, mount it on a toothpick and that's it! For the presentation, I have used a green picket fence planter box with a floral foam inside, to be able to place our 3 snowmen. I have used some cotton balls to make the 'snow'. Enjoy!